Taking a blood sample from a came (photo credit: Eric Fèvre). 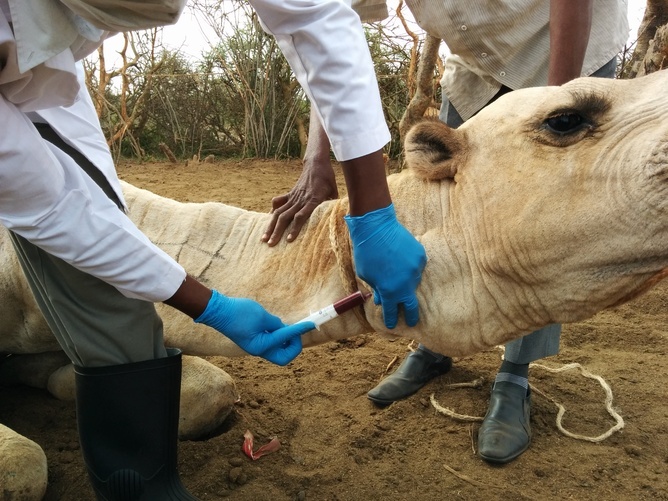 ‘African camels could hold important clues to controlling the potential spread of a respiratory disease transmitted by the animals. ‘For many years African camels have lived with the disease and the risk of it spreading to humans is still low. But more research is necessary to understand the disease better. This is even more important given the confirmation that the chains of transmission of the human Middle East Respiratory Syndrome Coronavirus (MERS-CoV) infection originated from contact with camels. MERS was first recognised in 2012. Camels are an extremely important source of livelihood, nutrition and income in Africa. They are especially common in arid and semi-arid areas of the continent, particularly in East Africa. But having these animals around may not be risk-free for humans.